Awnings create spaces that allow for get togethers, meals, and just simple relaxation. With a high quality awning, you and your outdoor furniture are protected from the elements. You don’t have to worry about the sun fading or overheating your furniture, nor do you have to deal with the ra in rusting and ruining everything you keep outside. 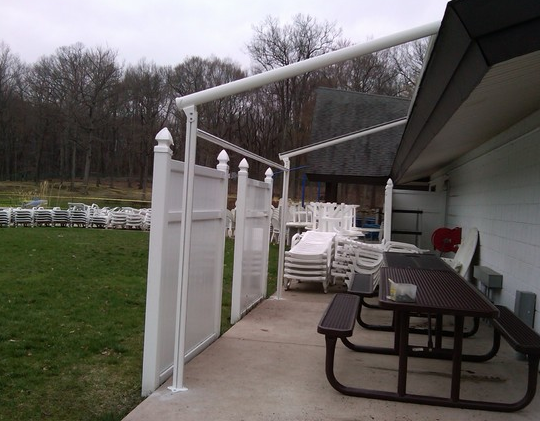 Awnings can be freestanding, like the one shown here, or they can be connected right to your home. Depending on the structure of your home and your outside space, we can figure out the optimal space for an awning. You can learn more about the different types of awnings we install by clicking here. Take a look at some of our awning ideas and give us a call at (800) 505-5860 if you think an awning would be the right fit for your home!